Calcium is an essential mineral with a wide range of biological roles including maintaining the health of bones and teeth. Magnesium when taken alongside Calcium may help support bone health. Vitamin D3 helps to regulate calcium levels in the body and is particularly important in skeletal development and bone mineralisation. Calcium Carbonate Prep. (Calcium Carbonate, Maltodextrin), Magnesium Oxide, Microcrystalline Cellulose, Calcium Citrate, Magnesium Citrate, Tablet Coating (hypromellose, hypromellose), Anticaking Agent (Magnesium Stearate), Sodium Carboxymethylcellulose, Vitamin D3 Prep. (Cholecalciferol, Beta-Cyclodextrin), Anticaking Agent (Silicon Dioxide). Below are reviews of Natures Aid Calcium, Magnesium & Vitamin D3 - 90 Tablets by bodykind customers. If you have tried this product we'd love to hear what you think so please leave a review. This product has made such a difference to my knee. I have arthritis in my knee and it can be very painful, but since taking this supplement along with a collegen supplement I buy from bodykind the pain is gone. Highly recommended. 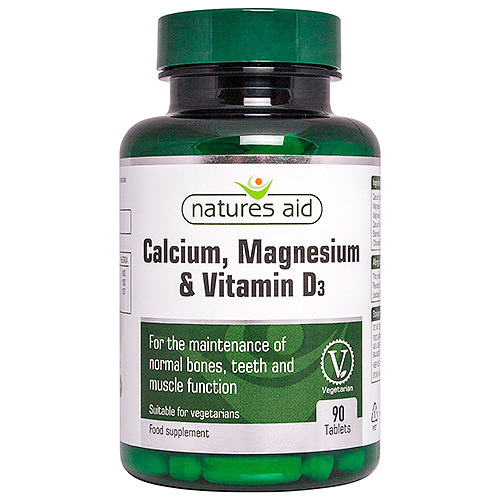 Natures Aid Calcium, Magnesium & Vitamin D3 contains calcium which is an essential mineral with a wide range of biological roles including maintaining the health of bones and teeth. Magnesium when taken alongside Calcium may help support bone health.